7.75" x 28" ; Made in the USA with 8 plys of hard rock maple and hand screen printed.A perfect reproduction of a classic 70s shape complete with wheels wells and a flat concave with a slight kick tail.All you have to do is adjust the trucks to your liking. 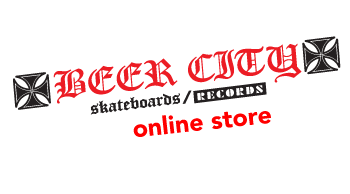 Comes with Independent trucks and risers , 88a Krypto Slammers* , Beer Nuts hardware and ABEC III bearings.Perfect for cruising the streets , sidewalks, parks or bowls. A great all around board. * These Krypto Slammers are blems/seconds , but ride perfectly.